(e-keen-oo-KAY-ree-us tri-glow-chidi-A-tus) Echinocerens is from the Greek echinos, meaning "a hedgehog," and cereus meaning "a wax taper." These names refer to the plant's spiny resemblance to a hedgehog (or so the early Europeans thought) and the plant's shape, respectively. Triglochidialus means "three barbed bristles" and refers to the straight spines arranged in clusters of three. 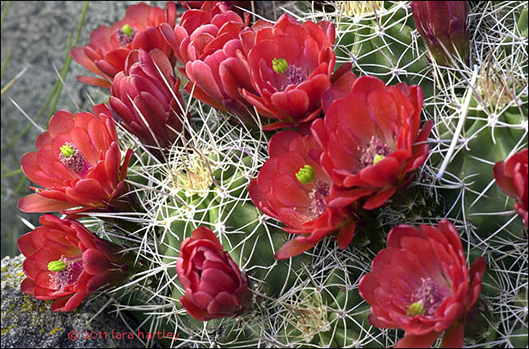 Also called claret cup cactus, after the reddish, cup-shaped flowers. Description: A small barrel-shaped cactus. Plant generally forms from a few to hundreds of spherical to cylindrical light- to bluish green stems in more or less round, large, dense mounds. The orange to red waxy flower is funnel-shaped 8 to 9 centimeters. The plant is densely spiny and somewhat woolly. Spines fall off readily or seasonally. The fruit is juicy and edible with deciduous spines. Habitat: Creosote Bush Scrub, Joshua Tree Woodland, Pinyon-Juniper Woodland. The plants grow in gravelly soils in grasslands, shrublands, pinyon/juniper, or aspen communities. The plants often grow against a rocky outcrop or within the rocky outcrop. Plants occur from three thousand and twenty to seven thousand nine hundred and fifty feet in elevation. Notes: There is a thick nectar chamber and many thready pink stamens at the center of the corolla. The flowers are pollinated by hummingbirds. Hummingbirds are the primary pollinators and must stick their entire head into the flower to reach the nectar chambers at the flower's base. In the process, the hummingbird's forehead gets dusted with pollen. (Sometimes they look like another species of hummingbird!) The flowers stay open at night, unlike many other species of cacti whose flowers close in the evening. The flowers last three to five days. Echinocereus triglochidiatus, a dicot, is a shrub (stem succulent) that is native to California and is also found outside of California, but is confined to western North America. Distribution outside California: to Rocky Mtns, Texas, Mexico. This plant was photographed in the Eastern Mojave National Preserve, April 26, 2003 with a Nikon D1. Cacti have a waxy coating, thickest on the sunny side. This helps the plant minimize water loss. The spines, which help deter herbivores, also provide small amounts of shade on the cacti's surface. The shade reduces the temperature on the stem and again helps to minimize moisture loss. To also minimize moisture loss to the atmosphere, cacti open their pores, called stomata, during the cooler hours of night to exchange oxygen and carbon dioxide. The plants photosynthesize during the day, but keep their pores closed. 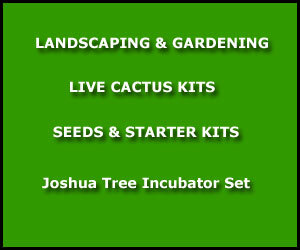 Cacti can store water in the pulp of the plant's fleshy stems; it is an old tale that one can get water from a cactus. After a rain, cacti can swell like an accordion with the extra moisture. 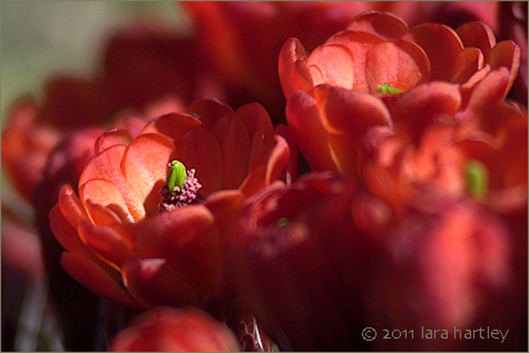 Some Native American groups collected the claret cup's stems, burned off the spines and mashed the stems. Sugar was then added to the mix and baked to form sweet cakes. Some specimens of the claret cup lack spines. Claret cup cacti can grow at high elevations due to the clumping of the individual stems which helps to reduce the amount of surface area exposed, thus reducing the rate at which heat is lost to the air.